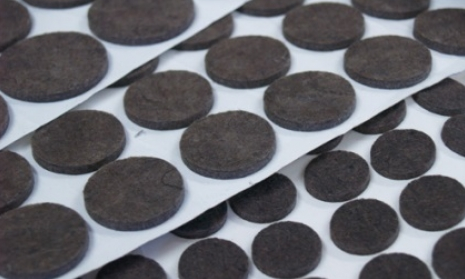 As a kind of manufactured felt self-adhesive felt has special features that make it usable in variety of industrial applications. The main question sounds: when and why can you use it? In contrast with other felt types it has self-adhesive bottom. Use it when you need better protection from scratches on your interior floor. Furniture legs can damage delicate surfaces. In that kind of felt there is a strong adhesive that makes it more adherent to the furniture leg. The fabric is softer and more friendly to your interior surface. Moreover, it lasts even longer than normal felt pads. Placing adhesive felt is possible under the lamp. It´s practical because it avoids scratches on furniture during dusting, moving the lamp from a place to another one. Using of adhesive backed felt is suitable to any component that demands anti-scratch covering. It´s worth to invest in a flat roofed underlayment. Cover of the house is sometimes exposed to adverse weather so it needs strong roofing materials. Adhesive helps the membrane make better contact with the roof, that prevents it from leaks and water. Adhesive felt is recommended to apply on a sunny day because it can help membrane to stay more flexible. This kind of felt can also be a part of your garage, shed, kennel. Even if you breed rabbits you can use it for their hutch. Our range of self-adhesive products includes wheels, strips, cubes, ovals, rolls, pads and other shapes specified by customers. We impregnate material with synthetic resin to make it durable and strong. To sum up briefly: this kind of felt is strength adhesive, quick to apply, protecting from external factors. Its thickness, composition and color depends on the purpose of using. It´s most commonly used to protect furniture, floors, roofs or garden buildings.